Seeing cities from above always has a je-ne-sais-quoi feeling. That’s why parties on terraces and in penthouses have this aura of being the coolest. In Berlin, for instance, you can get a view of the city from above (and for free) in the Reichstag and (for an entry fee) from the Fernsehturm – the TV tower. And they are two of the most visited spots of the city. In Stockholm I also went to the Gondolen Restaurant, an attic-bar, to check out the city from above – don’t forget to try its cocktails. But what about Helsinki? You go to the Ateljee Bar… and its toilets. The first time I heard a Finn talking about the Ateljee Bar he mentioned – besides its location – specifically its toilets. But I will talk about that later. Let me tell you about the bar first. 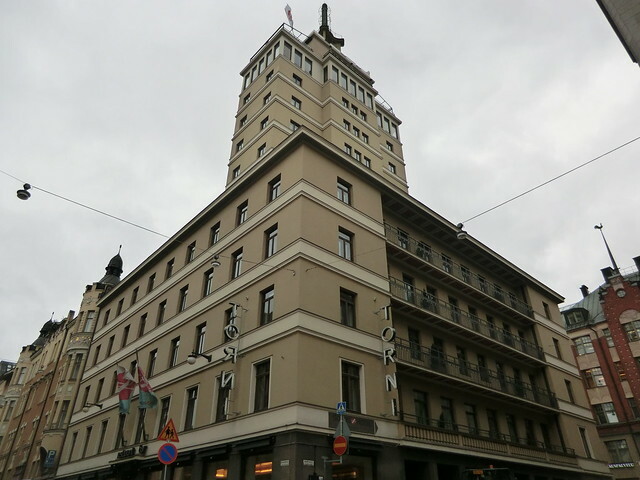 The Ateljee Bar is on the uppermost floor of the Torni Hotel (street Yrjönkatu 26) in the center of Helsinki. It is a hotel that belongs to the well known Nordic hotel chain Sokos. What makes this hotel stand out is their bar on the 12th floor: the Ateljee bar. The top floor of the Torni Hotel contains the Ateljee Bar. Source(CC:by-nd). One thing that I like about this bar and hotel is the words in Finnish they used to name it. 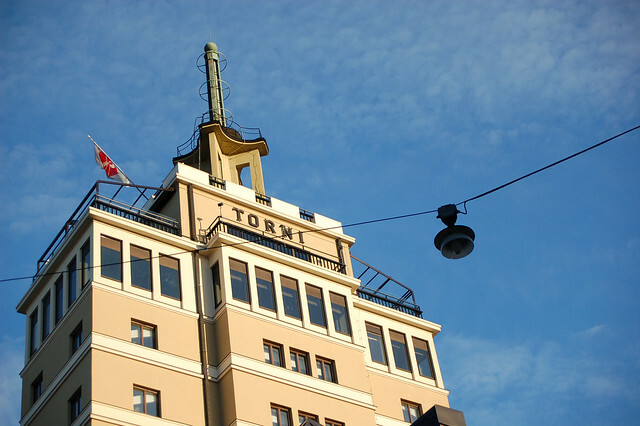 “Torni” is the Finnish word for “Tower”, and it is a tower indeed and for many years (1931-1976) it was the highest building in all of Finland. “Ateljee” means “Atelier”, a workshop. The Ateljee Bar (Official Website) is divided into two rooftops that each have a panoramic view of Helsinki. This photo has been taken there and you can see a lot of Helsinki from it; for instance, the iconic White Cathedral of Helsinki. See in different sizes. Source (CC: by-sa). The bar is the place where Helsinkians and tourist alike meet to see the city from above and have some Finnish beer, a Lonkero (a long drink composed of grapefruit lemonade and gin), some Finnish cider or even some Koskenkorva hard liquor (or whatever they choose). A bar on a rooftop must have some restrooms for its guests. 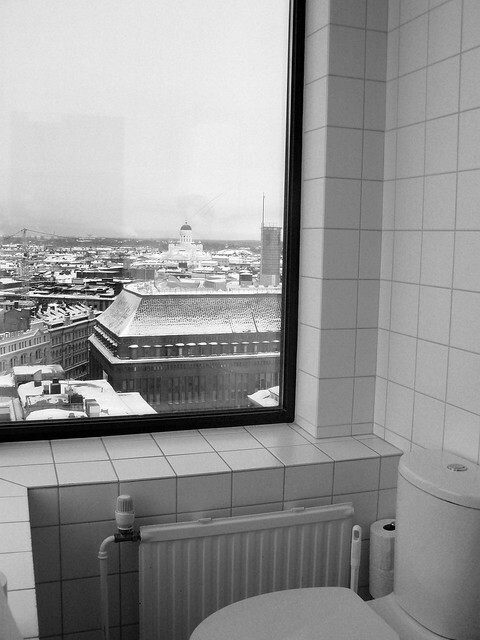 We do know that once we have had some beers, we are prompted to go to the toilet, and the toilets at the Ateljee Bar are famous throughout all Helsinki as the best in town: The view can’t be outmatched. They have some panoramic windows that allow guests to attend the call of nature without the need to stop enjoying the view: If you like scenery, the hotel designers must have thought – you must take that everywhere. Chapeau. These are the photos of the toilets for ladies and gentlemen in the Ateljee Bar. Try guessing which one is which, and I leave you the answer below both photos. These toilets are, unlike many public bathrooms in Helsinki, free to use. That’s right: The first photo is taken in the women’s bathroom. The wall you can’t see in the photo, to the left, is also a giant window. 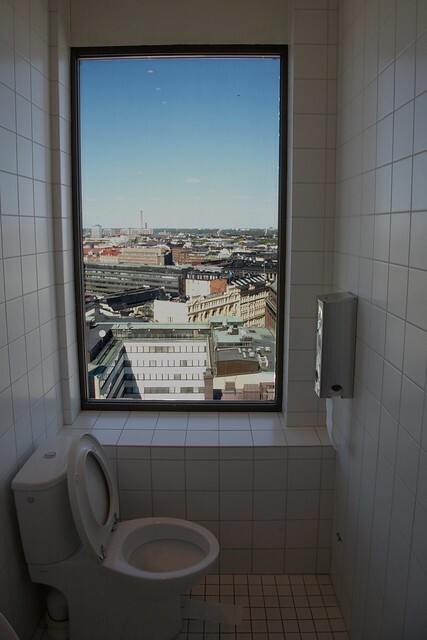 It makes sense: women mostly sit while using the restroom and this way they can enjoy the view while doing so. Also, the seat is down. The second photo shows us the restrooms for men. You can see that the seat is up and a condom machine. The bad thing is that the view can be distracting and the aim might be affected. 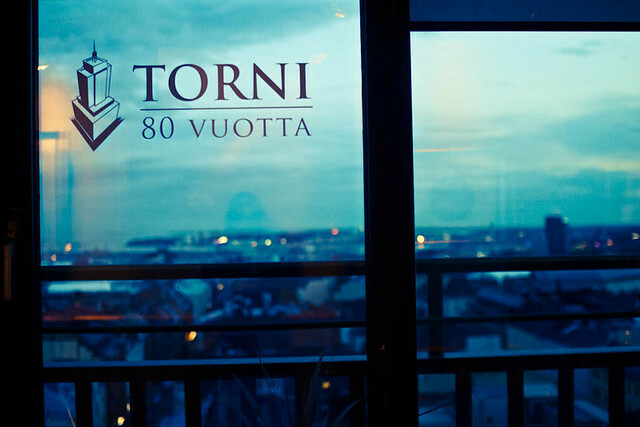 Have you ever visited the Torni Hotel and/or the Ateljer Bar? Will you do it in the future if not?